The new Tesa no-drill adhesive bathroom accessories are designed to provide a simple DIY solution for updating bathrooms without having to drill holes or use screws. 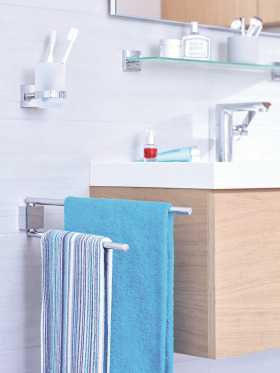 The 61-product assortment includes everything from towel holders, shelves, hooks, and shower storage. The five ranges available – with square and circle designs – combine modern design with patented Tesa Power Kit technology, which promises strong hold, easy mounting experience and traceless removal on a variety of surfaces including tiles, glass, wood and many types of plastic. Once removed, the products can be remounted, using a replacement Tesa Power Kit Adaptor – making Tesa bathroom accessories a longer-term solution, says the company.